What is absolute speed, if not that of light, that beyond which there is no more time, nor space, nor perhaps even energy? The logical conclusion is that any approach to watchmaking is in fact a reflection on infinity as we are able to admire it without actually comprehending it: it is an emotion born the dizzying sensation stemming from a reality that transcends our grasp. And this is where a deliberately chosen aesthetic option must express a philosophical choice. 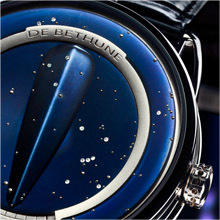 With this DB25 specially created for Only Watch, De Bethune has chosen light as the medium from which to sculpt its conception of the world, of space, and of time. The light of a nocturnal sky studded with gold and diamonds: the infinite realm of a starlit night. Not just any night: that of January 8th 1297, when the stars guided François Grimaldi through the narrow streets of the Monaco fortress. Disguised as a Franciscan monk, he slipped through the darkness to open the gates of this Genoese stronghold for his own troops. 700 years later, on this same rock, his descendant is still the prince of Monaco. François Grimaldi could still count the 105 stars that Providence had placed in the sky above Monaco: they are all of different sizes, appearing in white gold or invisible set diamonds. 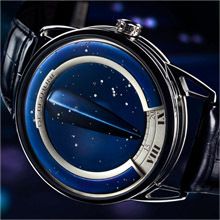 Orion and Gemini illuminate this flame-blued dial, of which each proportion and every detail has been arranged to express a perfectly mastered play on light with its shimmering reflections and gentle curves. The convex volume on the outer edge catches and holds the gaze, creating an illusion of infinite depth thanks to the concave centre. The backbone of this concave central mass guides the eye to where the time is read off in a window at the bottom of the dial where the sandblasted silver discs glide by, displaying Roman numerals for the hours and Arabic numerals for the minutes. 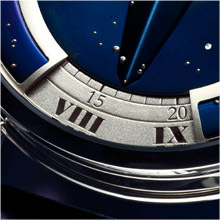 The dark glow of flame-blued and hand-polished titanium. The incandescence of white gold and diamonds. The silvery gleam of moonlight. The space-time continuum of cosmic immensity is frozen here on the wrist, for a magical moment spanning the chronological distance between the present and a seven century-old founding event and the present. Other expressions of light include the mirror or specular polish on the movement that erases the work of machines to reveal only the meticulous labour of artisans, their sense of beauty and their taste for perfection. It is a mechanism worthy of the finest masterpieces of the horological tradition, enriched with a good measure of innovation (the De Bethune silicon/platinum annular balance and other subtle technical features) that so rightly accompany any exceptional watch. Mainplate and bridges in bevelled and hand-polished steel with a specular polish reminiscent of the 19th century models made for royalty, nobility and the Chinese emperors. Depiction of the starlit sky above Monaco on January 8th 1297 when the rock was taken by François Grimaldi. The Orion and Gemini constellations stand out on the flame-blued titanium dial studded with 105 stars – 91 in white gold and 14 in invisible set diamonds. Hour and minute disc at 6 o’clock in pure sandblasted sterling silver engraved with Roman numerals for the hours and Arabic numerals for the minutes.